Viknesh Vijayenthiran July 12, 2015 Comment Now! Carbon fiber is seen by many in the auto industry as one of the most effective ways of reducing vehicle weight and thus improving acceleration, braking and handling while simultaneously curbing fuel consumption and emissions. But the expense of the material and finicky production process has mostly reserved its use for high-end cars. That’s now starting to change. A number of cars with price tags of less than six figures are now fitted with carbon fiber components, and with the arrival of the new Ford Mustang Shelby GT350R in showrooms later this year we’ll even have attainable cars with wheels made from the lightweight stuff. 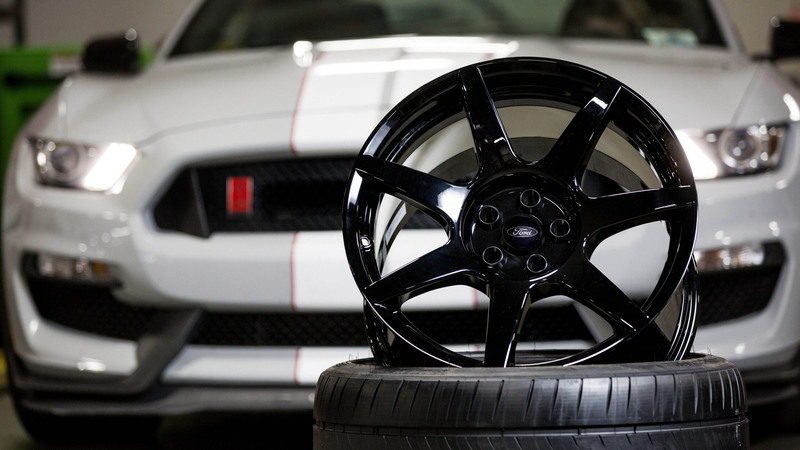 Previously the domain of the aftermarket or million-dollar-plus supercars, the Ford Motor Company [NYSE:F] now has the world’s first mass-produced carbon fiber wheels, which it plans to debut on its upcoming track-tuned Mustang. 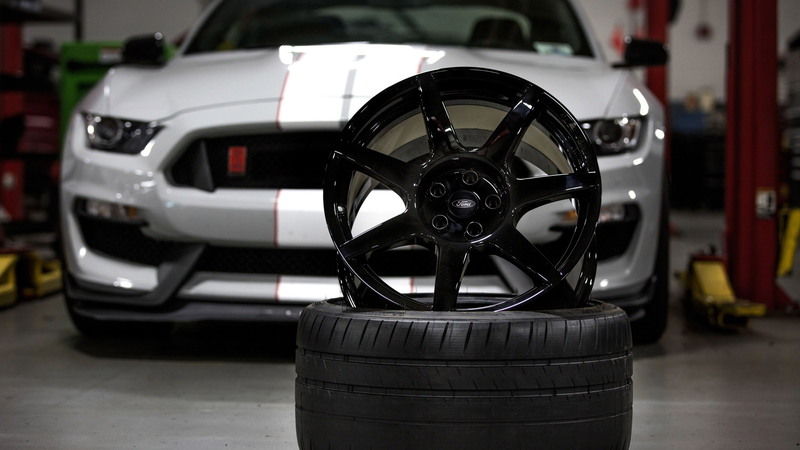 Ford first confirmed the carbon fiber wheels for the Shelby GT350R at the car’s 2015 Detroit Auto Show unveil, but now we have a close look at the finished product. The one-piece 19-inch wheels, which are equipped as standard equipment, are supplied by Carbon Revolution, the Australian firm first to bring to market carbon fiber wheels. The benefit is a roughly 40- to 50-percent weight reduction in those components not supported by the suspension, known as unsprung mass (18 pounds versus 33 lbs for aluminum for the Shelby GT350R, at each corner). Furthermore, they reduce noise, vibration and harshness (NVH), since the carbon fiber has natural damping properties. ALSO SEE: Carbon Fiber Wheels: A Costly Upgrade, But Better Performance? In testing with benchmark vehicles, engineers determined the lighter unsprung mass improved the suspension response times, chassis dynamics, steering feel and ride quality. It also enabled vehicles to start, stop and turn faster because of the reduced wheel rotational inertia, and the lighter unsprung mass meant the suspension components were not working as hard to keep the tires in contact with the road over undulating or broken surfaces. 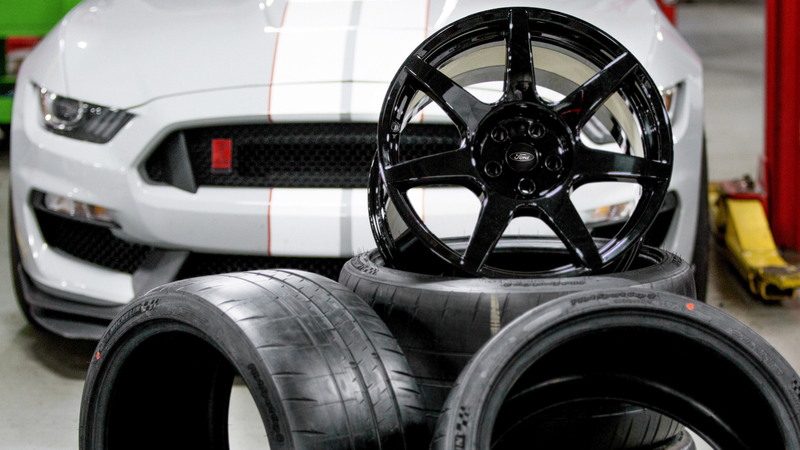 Although Carbon Revolution has been the leading manufacturer of carbon fiber wheels, significant innovation was needed to meet Shelby GT350R program needs. 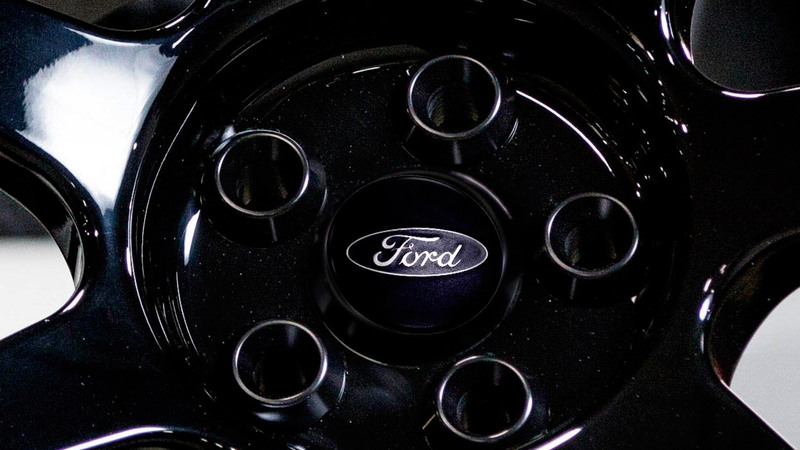 That’s because Ford sets extremely high testing requirements for its wheels. For example, they need to survive high-speed curb strikes, UV and chemical exposure, and extreme heat durability testing. They also need to have a finish that’s near flawless. Unfortunately, the finish is a gloss black, so you don’t actually see the weave of the carbon fiber. In the curb-strike test, Ford says that due to lightweight, advanced construction methods and resins in the wheels, along with the highly-developed MagneRide dampers fitted to the Shelby GT350R, the suspension was able to react so fast that the driver wasn’t sure the test had been carried out correctly and thus needed to repeat it. Essentially, the quicker response greatly diminished the severity of the impact. Another tough test is heat exposure (the Shelby GT350R’s brake rotors reached temperatures in excess of 900 degrees Celsius during testing). To combat these heat levels, the wheels feature a multimaterial coating formulation that provides an excellent thermal barrier. Using a plasma arc gun to liquefy a ceramic material, the wheels are coated at critical points around the inner hub and on the back of the spokes. The result is an incredibly thin, nearly diamond-hard coating that shields the wheel from heat. 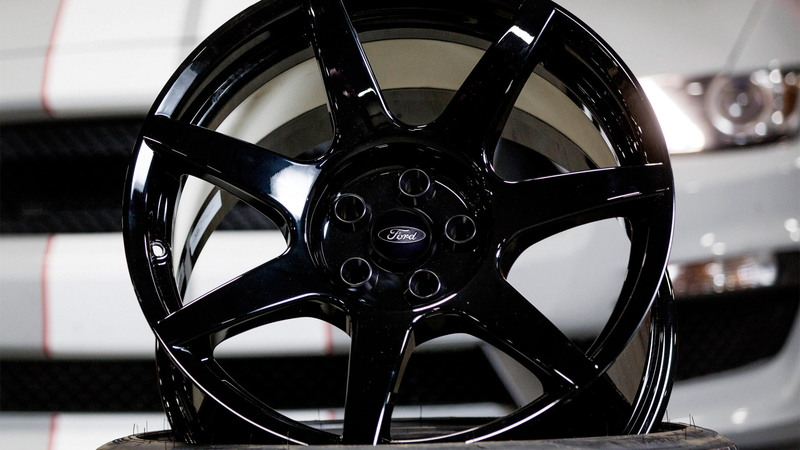 Manufacturing carbon fiber wheels begins with the creation of the preformed internal carbon structure, composed of precisely manufactured carbon strands arrayed into woven fabrics. The elements are then placed into a mold to which an RFID chip for monitoring purposes and resins are added before the whole thing is cured in an autoclave. The Shelby GT350R, together with the slightly tamer Shelby GT350, are being introduced this fall as 2015 models, though just 137 of these '15 models will be built to honor the original 1965 Shelby GT350 built by Shelby American. Once this initial batch of cars is built, Ford switches over to 2016 models that will be built and sold in higher volumes. Pricing hasn’t been confirmed but the GT350 is expected to start at just $49,995, including Ford’s standard $825 destination charge as well as a $1,300 gas guzzler tax. The GT350R should start at $63,495, with the same destination and gas charges, making the car an absolute bargain. Not long ago, a set of carbon fiber wheels would set you back close to $15k. Both cars are powered by an 5.2-liter V-8 with a flat-plane crank and output of 526 horsepower and 429 pound-feet of torque.